Please note that we will only support Enterprise VoIP queries relating to call quality issues and the configuration of a trunk in or trunk out. 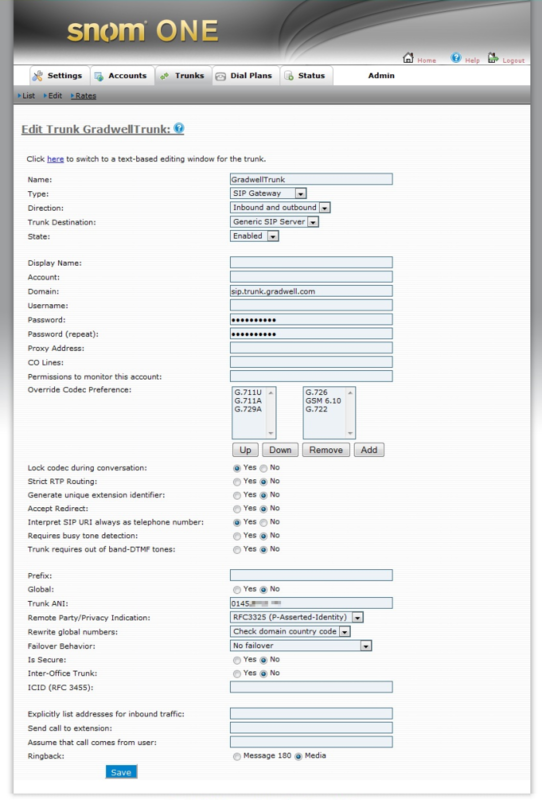 This guide assumes that you have set your IP range up in the Gradwell control panel (in the SIP Outbound IPs section). The snom ONE administration and configuration is managed via a browser-based tool suite. To log in to the administrator tool suite, type the URL of the server into the navigation bar of your web browser and log in. Type a name for the trunk, and change the Type field to SIP Gateway. In the Domain field type sip.trunk.gradwell.com, and leave the password field blank (please note that when you save the configuration this field will make it appear that it has a password in it, this can be ignored). Finally, in the Trunk ANI field, add the CLI (phone number) for the trunk. Click Save and the trunk should be ready to make outbound calls. The screenshot below may assist you in setting up the trunk. We also strongly recommend that you disable RTP encryption on each individual snom phone that is connected to your snom One PBX to prevent audio issues.